Elaine Halford is no stranger to flood destruction, having lost precious items in a flood herself. 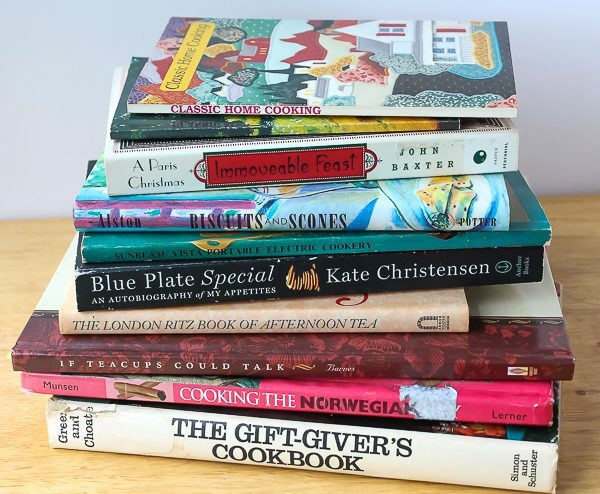 When she read about the flood of The Culinary Cellar, this generous soul sent me a box of cookbooks. We have since talked on the phone and she joked that we are “Underwater Paper Sisters.” Not only has she sent cookbooks here, but contributed to the victims of much worse floods where people lost everything. Elaine sent support to St. Maarten because she spent her honeymoon there in 1969. To say she is a generous soul is an understatement. Not to mention she is hilarious and had me in stitches on the phone. The world needs more Elaines. I love local and church cookbooks! 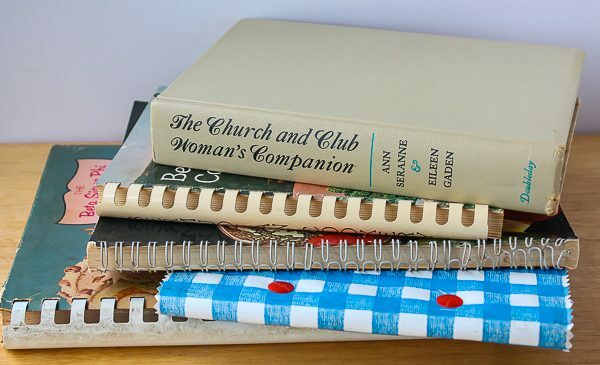 As I was looking through Elaine’s box of books to write this blog, the one that jumped out at me was The London Ritz Book of Afternoon Tea because as we all know, the Royal Wedding of Harry and Meghan took place this weekend. How could I not write about something British? 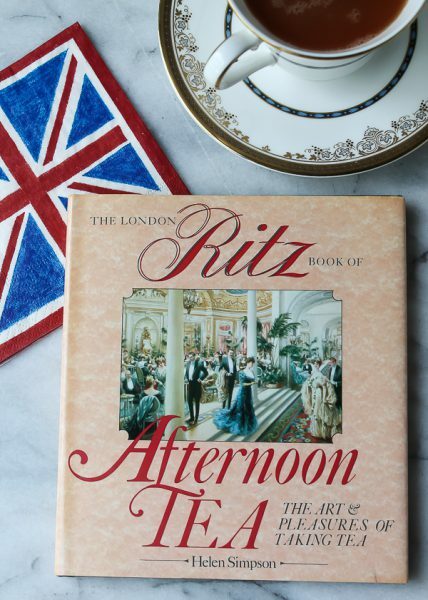 This lovely little book focused on tea at the Ritz in London, but most of the recipes are classics at any afternoon tea. I decided to concentrate on the sandwiches, which is the first course of afternoon tea. I made the classic cucumber, ribbon with cream cheese, and smoked salmon. The cucumber sandwich is started by peeling an English cucumber and slicing very thin. The slices are placed in a bowl with a splash of white vinegar and sprinkled with salt. After an hour they are drained and patted dry. White bread is buttered then the cucumbers are layered on the bread and cut into fingers, and always cutting off the crusts. The ribbon sandwiches use both white and wheat bread spread with cream cheese, and then alternate colors of bread before slicing. The recipe for the smoked salmon sandwiches is below. Serve these delicious sandwiches with a cup of hot tea. 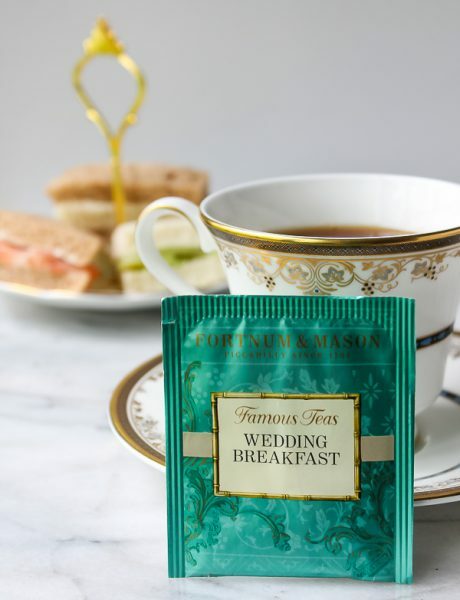 I just happened to have a Fortnum & Mason tea called “Wedding Breakfast,” perfect for sipping while watching the Royal wedding. Some love milk in their tea. 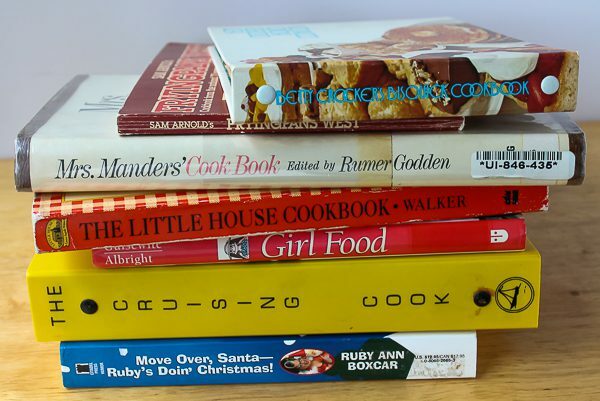 Thank you, Elaine for all the cookbooks, and especially one I could use for today. Both of my girls and my granddaughter are here visiting and we all enjoyed everything. However, I did not get up at 4 am to watch the wedding, but my girls got up at 5:30 to watch. Grandma decided to watch the tape! I also decided that we should name you Duchess Elaine of Upper Darby. Seems appropriate for today to coincide with Duchess Meghan of Sussex, although to me, you would be a Queen! In a mixing bowl, place the chopped salmon and ⅔ cup of the cream. Toss well to absorb into the salmon, then press through a mesh sieve to remove the cream, but some will stick to the salmon. Return coated salmon to bowl and discard cream. Add the whiskey, ½ teaspoon white pepper, and nutmeg to bowl. Mix well, cover bowl, and chill. When ready to serve, whip the remaining ⅓ cup cream until stiff peaks form. Fold into the chilled mixture a little at a time to make the filling. Lay slices of bread out on work counter and butter 2 slices on one side. Spread on some of the filling, then some of the paper-thin salmon slices, dust with a little more white pepper, and top with another slice, buttered side down. Cut off crusts then slice into triangles. Repeat with remaining ingredients and bread slices. 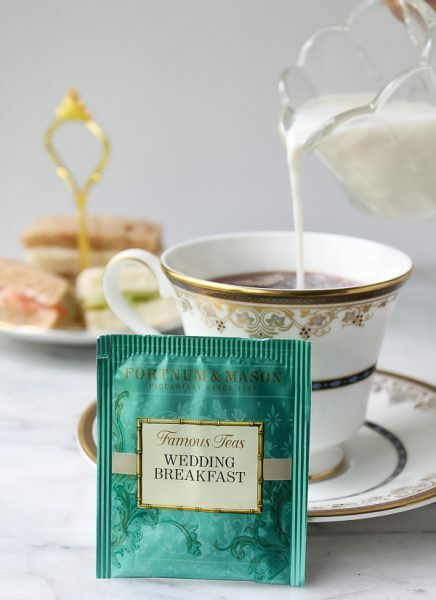 Serve with tea. Thank you for the latest recipe and your latest news on the Culinary Cellar! We girls never outgrow a tea party!! Wonderful all your girls were with you to enjoy your Royal Wedding Tea Party. 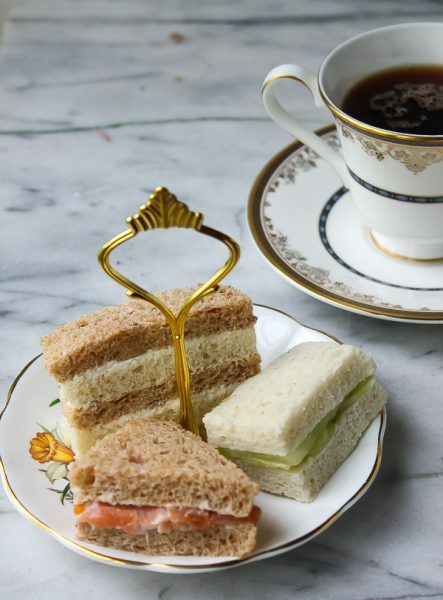 Your smoked salmon sandwiches sound delicious and your china is lovely, too. Perfect! The girls and I always love a tea party. It never gets old! Thank you for the compliment on my china. I love it and should use it more often.